The weather of the last 24 hours has consisted fog and virtually non-stop drizzle making me appreciate the fact it has been pretty favorable for most of my trip. Leaving Tok I headed NE on the Alaska Highway until I reached the turnoff for Chicken and the Top of the World Highway. Not long after the pavement ended I pulled into Chicken, a town that has a population of 6 during the winter according to the Milepost! Swelling to a party sized 21 during the summer, I asked the person serving me tea in one of the three trading posts if she was one of the six. The reply was “no” but was informed that the woman in the Post Office was one of the year rounders. Leaving Chicken I continued to the turnoff for Eagle which was about 65 miles due north and situated on the Yukon River. Milepost recommended visiting Eagle so I meandered along the dirt road for a couple of hours until I reached the small town stopping at the one cafe there for lunch. A tour bus was just leaving, I suspect to drop people off at the boat that transports tourists to and from Dawson City. The cafe was akin to a roadside “greasy spoons” in England and it struck me as strange that there appeared to be no desire in the one eatery in town for some quality food! Perhaps it is lack of competition, few visitors and a short season, I’m not sure. I suppose that as with most frontier towns, most food arrives by way of the distribution system rather than relying on a locally cultivated cuisine. May be I just missed the more exquisite menu items. Passing through Canadian Customs on the Top of the World highway fog engulfed the vista. I asked the officer about the view and she said it is usually spectacular and maybe if I waited for a few hours I would see it. She then said it had been like this all day. Despite my suspicion that it would be in vain, I pulled over a few hundred yards on and waited. A couple of hours later and my skepticism was born out. As I began descending toward Dawson City the cloud cleared and I at least got some idea of the views I had missed at the top. 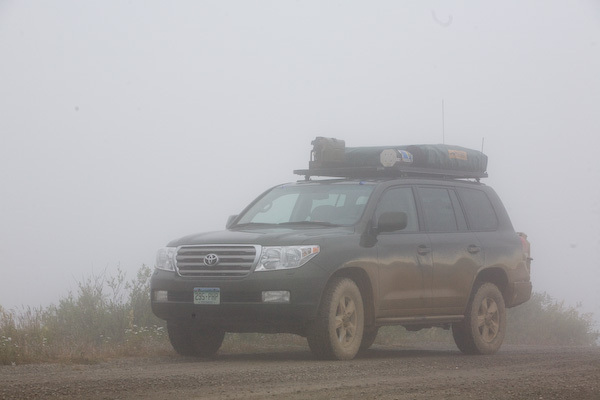 Once at the Yukon River I drove on to the ferry that still makes the Alaska Highway the only true overland route between Canada and Alaska and entered Dawson City where I would spend the night before beginning the Dempster Highway in the morning.